with the Saxon invasion (400-600 AD) following the collapse of Roman power. They held a family seat as Lords of the Manor in Lancashire. There were Mapps in Shropshire County, England in the 1600’s. Perhaps this is where the Barbados Mapps came from. 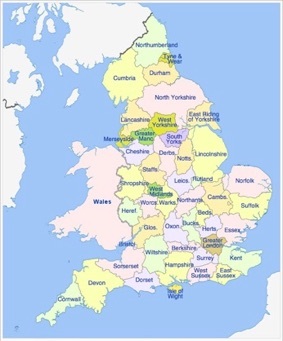 Shropshire county is in the west of England next to Wales. 1618, birth of John Mapp, who left Shropshire, England in 1654 and moved to Northampton Co, Virginia, where he died in 1687. Shropshire County supported King Charles I in the English Civil War and in 1644 surrendered to the parliamentary forces. This could have been a incentive to emigrate. There also was quite a lot of turmoil over the re-institution of King Charles II in 1660. For whatever reason, Thomas Mapp was in Barbados by 1663. It is not known when the Mapp family first came to Barbados. Mapp is a fairly common name in Barbados. There is a Mapp Hill and a Mapp sub-division. From records available we know they were there from the mid-1660s, becoming early settlers. There are lots of Mapp births and marriages from 1665 on. See Mapps in Barbados records. ✦1663 - Thomas Mapp was the executor in the will of Roger Tompkins, planter. ✦1686 Thomas and Eliza Mapp’s daugh, Mary was bapt in St. Philip, Oct 21. ✦1687 Thomas Mapp is mentioned in the will of Mary Powell, widow. A list of the inhabitants of Barbados in 1638 (who possessed more than 10 acres) do not include a Mapp. So Thomas must have arrived in Barbados between 1638 and 1663. 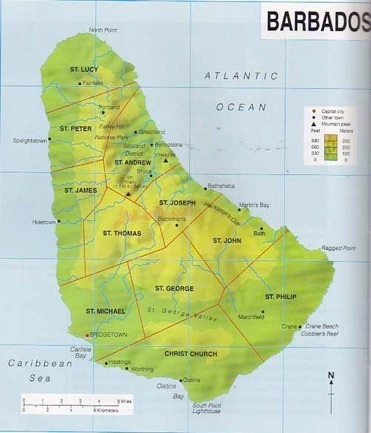 There were 2 Mapp men in the 1660’s in st. Philip, Barbados: Thomas & Edward. In 1680 there was also Lawrence. Thomas Mapp Sr, (most like the ancestor of this family) was b abt 1640, probably England. First appeared in Barbados records in 1663. It’s possible he came to Barbados about this time with his sons (or brothers): Edward & Lawrence. 1680 Edward Mapp’s daug was bapt. In 1680 St. Phillip census along with possible brother, Lawrence Map. Thomas was buried Jan 3, 1706 St Philip. Samuel Mapp-1, (son of Thomas Sr, brother of Thomas II) 1670-1715, m 1697 Elizabeth Sparke in St. Michael; sons (from will): Robert, Thomas. A Samuel Mapp was buried Oct 28, 1753, St. John’s. Thomas Mapp II (son of Thomas Sr), b abt 1670, was prob Capt. Thomas Mapp in 1717. maybe m Susanna. Thos & Susanna had daug Martha 1703 St. Philip. Thomas II was buried Dec 14, 1737 St. Philip. Samuel Mapp-2 (son of ? ), began the Mapp plantation in 1721 in St. Phillip. In 1741 he? married Katherine Gibbes. His son, Samuel-3, bapt 1745. His daug (or gr-daug) Mary m Richard Smith. Did she inherit the Mapp plantation bc he had no sons? Thomas Mapp (son of Samuel-1), b abt 1702, bapt Oct 1702 St. Philip. Thomas Mapp (son of ? ), b abt 1732; he married Mary King who in 1757 had inherited the Valley estate in St. George from her father. Robert Mapp (son of ? ), b abt 1760, m Sarah Burgis in 1785 in St. John’s. I do not know the connection to the following Robert Mapp. Robert Mapp was born about 1787, probably in St. Philip Parish, Barbados. There was a Mapp plantation located there, but at this time is was owned by Richard Smith, son-in-law of Samuel & Katherine Mapp (original owners). Parents: There was a Robert Mapp who married Sarah Burgis in St. John's Parish, Dec 3, 1785. This is a possibility for his parents, but it was in St John’s not St Phillips. St. Philip’s Church in St. Philip’s Parish, Barbados. The second building, built in 1786 and destroyed by hurricane in 1831. The third building was built in 1831 and partially destroyed in a fire in 1977, but the church records were saved. Robert Mapp of St. Michael buried March 10, 1827, age 40. 1.Mary Elizabeth Mapp, b abt 1815, St. Phillip. Married Thomas Bourne. May have died 1890 and buried in Christ Church Parish. 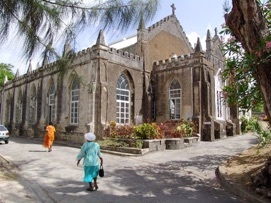 2.Louisa Harriet Mapp, b abt 1817 Barbados, baptized Mar 3, 1817, St Phillip’s. 6.Thomas Golding Mapp, b abt Feb 1824, St. Phillip’s. May have died at 8 months? He had 3 brothers, Robert, Joseph Henry & Thomas Golding, and 2 sisters, Mary Elizabeth and Louisa Harriett. Pirates also lived in Barbados. In fact, John Thomas was born the year after a locally-famous buccaneer, Sam Lord, built his castle there. 1838 - the slaves in Barbados were emancipated. St. Matthews Anglican Church, Jackmans, Barbados where John Thomas Mapp was married. Originally built in 1830, but destroyed by the hurricane of 1831. Rebuilt in 1832. Mary Catherine Carter was the daughter of John Henry Carter and Catherine Lewis Young. She named one of their sons Nathan Lewis Young Mapp, for her mother, Catherine Lewis Young, and for 2 of Mary’s brothers, Nathan Carter and Lewis Young Carter. Catherine Lewis Young was the daug of Dr. Lewis Young (1765-1817 & Elizabeth Ann McConney), who was the son of Dr. Nathan Lewis Young (ca1734-1771 & Mary Padmore), who was the son of Dr. Nathan Lewis Young (ca1710-1754), who was the son of William Young (1690-1746 & Rebecca Lewis), who was the son of George Young (b1666 Barbados & Alice Powell). These were early planters in Barbados. No Mapp or Young or Carter was on the list of 1638 inhabitants (with more than 10 acres) of Barbados, so George’s father must have arrived between 1638 and 1666. John Thomas died about 1875 in Georgetown, Barbados at which point the two youngest boys, twins, James Chapman Mapp and Nathan Lewis Young Mapp (aged about 19), emigrated to Canada. There's a family story that they came to Canada because it was too hot in Barbados. These two may have been the only ones in the family to go to Canada. Lake Papineau is located north of the Ottawa River between Ottawa and Montreal. 6.John Thomas Jr. MAPP b: abt 1854; may have d in 1884, Barbados. Matthew James Chapman (1796-1865) who was born in Barbados and went to England at an early age and began writing in there. His lengthy poem “Barbadoes” was published in 1833, a part of a tribute to his native country. In the poem he describes the hurricane of 1831 and the volcano of 1812 on St. Vincent, along with native scenes. There was a James Chapman bapt in 1720 in St. Philips. 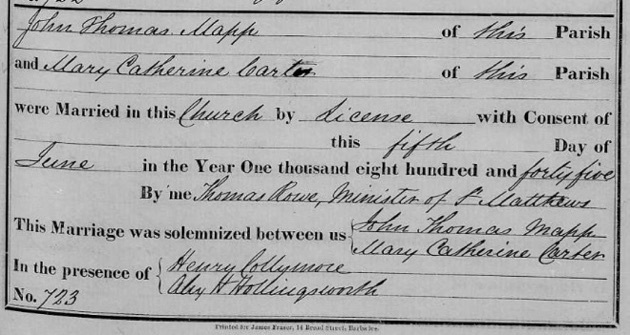 There was a James Chapman Austen b1843 NY, but his father Thomas Austen was b1808 in Barbados. There was a Lt-Col. James Chapman Lovely in 1883 in Adelaide, South Australia. According to family members on Barbados, Nellie (pictured at right; daug of Mary Catherine Mapp) was a very independent woman. She had no children with Wakeford. They moved to St. Kitts at some point where Nellie worked as a contractor building houses. She earned the money and Wakeford, as one relative said, “was a bloody old smuggler” (smuggling was not uncommon between the small, close islands). Wakeford got involved with a woman there on St. Kitts and eventually had some (8) children with her. Nellie left him and returned to Barbados where she lived out her life. 2. Lewis Reece, brother of Nellie, 1907. 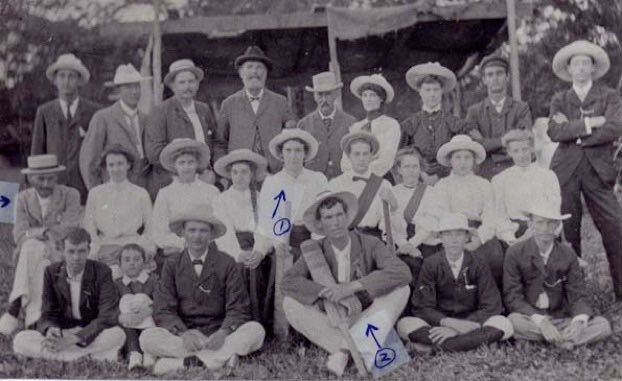 #1-Nellie Reece, #2-Lewis Reece (children of Mary Catherine Mapp Reece), the arrow on the left points to Wakeford Elliot.